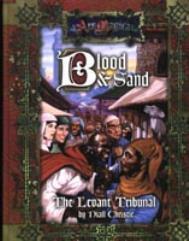 Blood & Sand: The Levant Tribunal is the indispensable guide to the Hermetic Tribunal of the Levant. It details the mundane and Hermetic geography and history of the area, shaped by Islam and the Crusades. It describes the inhabitants of the region, be they emirs in mighty castles or traders in the Latin states, magi of Hermes or Muslim sorcerers, jinn or naddahas. From the Ark of the Covenant to the criminal underworld of Acre, this book provides everything you need for a saga set in this most volatile of Hermetic tribunals.